West Palm Beach is a haven for anyone who loves to bask in the sun on clean white beaches. There are plenty of music festivals, boat shows, classy night clubs, and famous eateries lining the shores. But one of the best ways to enjoy your adventures here is by renting a jet ski for everyone in your crew. There are many options for exploring the beaches of West Palm Beach. You can book booze cruises, paddle boats, or even sailing excursions. All great options. But jet skis are usually a much less expensive way to get around. You can rent them for a couple of hours or an entire day and see all the sights along the shoreline. In fact, with jet skis you might get to see things you wouldn’t normally be able to go. If you’re staying a few miles down the shore, you might not decide to hop in your car and travel to another area. But with a jet ski, there’s no parking or maneuvering issues. You can jet up and down the shore, checking out houses, scenery, and shops in different locations. For example, you might be able to ride on over to Peanut Island and check out the beautiful tropical state park the area is famous for. If you wish to jet ski West Palm Beach, jet skis really are the best way to go. Other ways of travelling the water take time and some level of skill. Water skiing can be extremely challenging to pick up, especially if you don’t get much practice. Sailing can take years of instruction, not to mention the cost. And surfing, well, that’s a whole different sport that doesn’t lend itself to much sightseeing other than the underside of a wave. Boats aren’t terribly difficult to use, but they do require a little skill to operate. But jet skis, on the other hand, don’t have much of a learning curve at all. Press a button and head off. It really is almost that easy. Believe it or not, riding a jet ski can actually be good for your health. But the best part about it is you won’t even realize it because you’re too busy having fun. 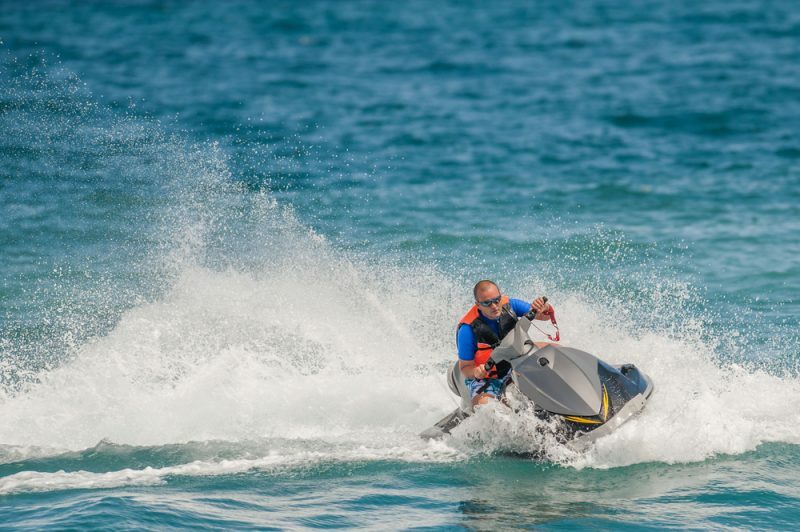 No matter what your skill level, operating a jet ski requires balance and some movement. As you ride the waves, you’ll be burning more than 400 calories an hour. This is especially true when you crank up the speed and use your body for maneuvering. The same thing also gives you a great muscle toning workout. Balancing requires you to contract both your abs and your legs to stay aboard in rocky waters. And don’t forget the endurance benefits of such a cardiovascular activity. Depending on how adventurous you decide to be, jet skiing can be a better workout than running. In addition to all the other great things about jet skis, we’d be remiss to leave out the fun factor. Whether you’re an adrenaline junkie or a leisurely stroll kind of person, jet skiing is one of the most entertaining activities you’ll ever participate in. You can rev up the motor and race your friends or ride at a leisurely pace alongside your family. But if you don’t visit the water enough to justify buying them, renting them is the best way to go. Besides, this way you won’t have to maintain or store an extra piece of equipment. You can just hop on and enjoy.